This book provides a comprehensive method for learning modern management processes, and applying those methods to improve leadership in educational settings. 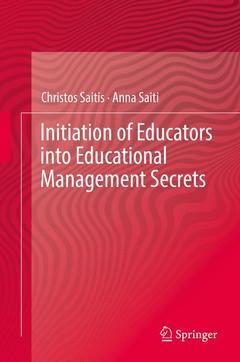 The authors include case studies and techniques to solve a variety of managerial problems so that members of the educational community may improve their abilities and skills in a range of related disciples, including: strategic planning, effective decision making, time management, management conflict strategies, oral communication, management strategies for school crises, and the development of good relations and a cooperative spirit. Chapter 1.Basic Dimensions of School Leadership.- Chapter 2.The function of planning and programming.- Chapter 3.Decision making and problem solving.- Chapter 4.Leadership and Leaders.- Chapter 5.Communication in the field of education.- Chapter 6.Conflict Resolution and Complaint Management at School.- Chapter 7.Practical strategies for the Teachers’ Council operation.- Chapter 8.Dimensions of School Management Leadership.- Chapter 9.Control Process in Education._ Chapter 10.Crisis management at school.